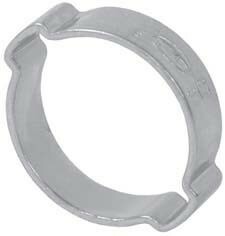 # DIX0507R - Pinch-On Double Ear Clamp - Size 1/4 in. - Hose Range: 0.197 Closed to 0.276 Open. - 304 Stainless Steel - When ordering double ear clamps, select nominal clamp size nearest to, but always larger than, the OD of material to be clamped after insert has been fitted.